FoldSynth is an interactive multimedia platform designed to help people understand the characteristics of molecular strands with an emphasis on proteins. 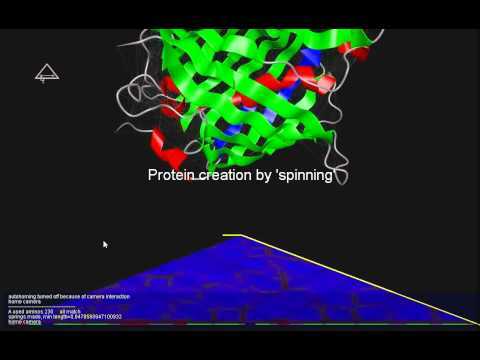 It uses a simple model of molecular forces to give real time interactive animations of the folding and docking processes. The shape of a molecular strand is shown as a 3D visualization floating above a 2D triangular matrix representing distance constraints, contact maps or other features of residue pairs. The 2D visualization is also interactive and can be used to manipulate a molecule, define constraints, control and view the folding dynamically, or even design new molecules.